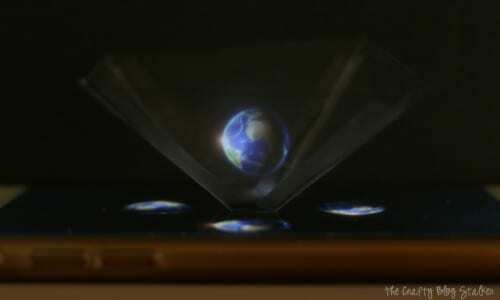 How to make a hologram with your smartphone is an easy DIY craft tutorial idea. Use this hologram projector tutorial and YouTube videos for amazing results. I recently saw the coolest thing and I have been so excited to share it with you. 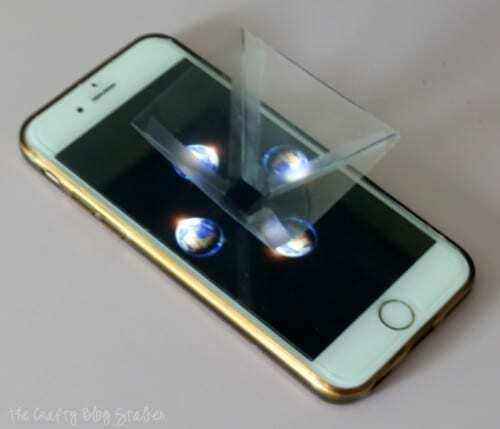 You can make a hologram project using simple sheets of plastic and your smartphone! Seriously, and it really is so simple to do. I created a free printable PDF with the instructions and pattern to make it even easier! You can download and print the free pdf here. I do have a video if you would prefer to watch the tutorial. If you like my video subscribe to my YouTube Channel so you don’t miss out on any future video tutorials! The printable pdf pattern shows two different sizes. For small screens like smartphones, use the shape on the left. 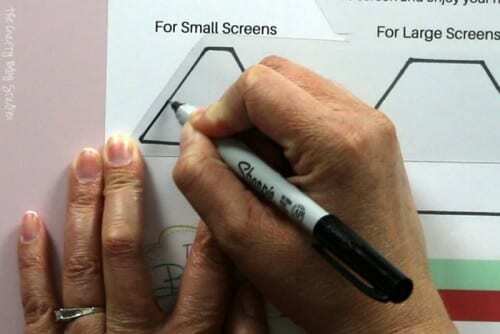 For larger screens like tablets, use the shape on the right. 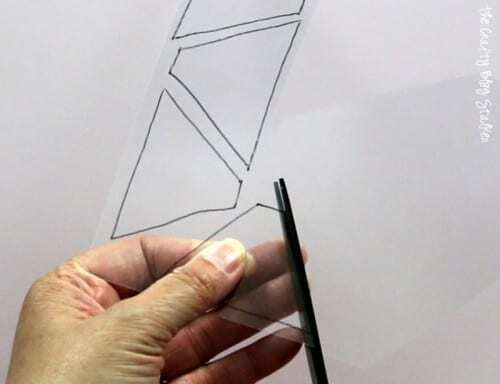 Take a fine point Sharpie marker and trace the shape onto the plastic sheet. The hologram projector is four-sided so trace the shape four times. 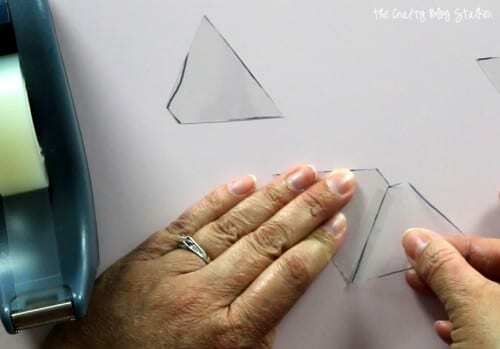 With a pair of scissors cut out the four shapes. 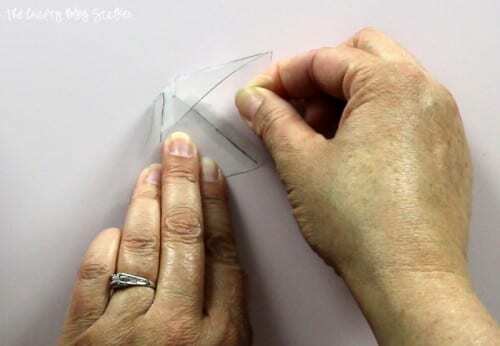 Use transparent tape to assemble the cone, but cut the strip in lengthwise first. This will make the strip thinner so you won’t see as much of the tape on each corner of the cone. Align the shapes by the sides keeping the short and long sides together. When adhering the last two sides/corners together you will see the plastic take a cone shape. That’s all there is to it! Easy Peasy! Now it’s time to use it! YouTube has a bazillion videos that can be used with your new hologram projector. Simple type hologram into the search and they will all be listed for you. The video I used while creating this tutorial is Hologram Project by Kiste. Place the hologram projector you made on the screen in the center of the video with the small part of the cone down. Get eye-level with the phone and see your hologram projector come to life! So did you make one? What was your favorite hologram video that you found? Share and leave a comment below! 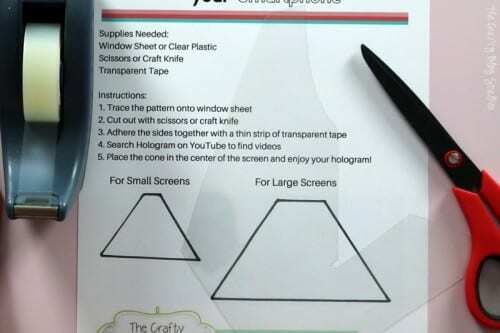 SAVE HOW TO MAKE A HOLOGRAM WITH YOUR SMARTPHONE YOUR FAVORITE DIY PINTEREST BOARD! So interesting! Thanks for sharing with the Thursday Blog Hop! This is amazing! I’m doing this with my kids this weekend. They are going to love it. I love how easy it is to make! Whoa, that’s awesome! Thanks for sharing! You are welcome Rachel, you should really try it! Thank you so much Dianna! I can’t wait to see! this is incredible!!! thanks so much for sharing at Funtastic Friday! This is way cool! Thanks for sharing with us at Brag About It! Pinned and tweeted to share. Thanks Dee, I hope they have fun! Tried to download the free pattern as a PDF, but Adobe keeps telling me that it is not a valid PDF. Anyone else having this issue? If so what to do to fix? I sent you an email with the PDF. Let me know if you are still having problems. Thanks, Janice! It really is a fun little project! Thanks, Patrick! I’m glad you like this tutorial on how to make a hologram with your smartphone. It really works! Ha ha! Do it Kate! I’m a mom, I get it! Thank you Kate! It was a fun little project! Incredible! I wish my science-loving daughter were still at home so we could do this together. This may be the only craft I have ever awarded the Most Inspirational Post at the Inspire Me Monday Linky Party. Congratulations! You won and will be featured on my site tomorrow. Congrats. Seriously cool. Thanks Janice! It’s an honor to be featured! You are welcome Stephanie! It’s a fun little project!